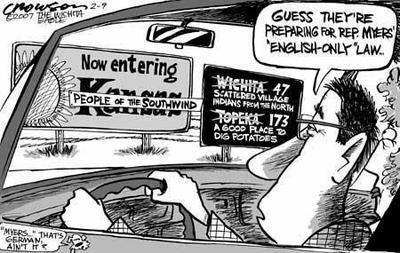 Jim Sullinger points out this cartoon from today's Wichita Eagle. A Kansas Senate health care task force released four proposals Thursday designed to reduce the costs of health care and expand access to it. This is seen by many lawmakers as the session's biggest challenge. The gauntlet was laid down with force by Gov. Kathleen Sebelius during her state-of-the-state address. Encourage the parents of eligible children to enroll in state-funded health care programs. Currently, some 71 percent of the children eligible for income-based programs don't participate. Use more tobacco settlement money for anti-tobacco programs. The "Connector": an ambitious plan to encourage the creation of health plans that belong to the person, not the employer, and that follow them when they change jobs. How this would work, who would pay what, and what the insurance companies would do, remains to be seen. But the Senate is serious about figuring it out. Sen. Jim Barnett, an Emporia Republican, a physician and the chairman of the task force, said he wants to see action on health care legislation this session that will reduce costs and expand health care access to as many Kansans as possible. “We believe it is very doable this session,” he said. Thirty-seven of the 40 Kansas Senators are signed on to legislation restriction funeral protests. SB 244 would create a 300-foot protest-free buffer around funerals for one hour before and two hours after a funeral service. The bill would also make it illegal for protestors to obstruct a public street or sidewalk. Last year, a similar bill failed to pass because lawmakers were afraid it would be struck down in a court challenge and the state would wind up paying the legal fees for protestors, in this case, Topeka's Westboro Baptist Church, which protests the funerals of soldiers across the country. This year, lawmakers had a creative idea: get the attorney general to ask the court for a declaratory judgement on the law before it takes effect. That way, the Legislature will know whether the law works before anyone can sue. Shirley Phelps-Roper, attorney and Westboro member, thinks that's great. "It just saves us the trouble" of suing, she said. She expects the law to be struck down. Republican John Dennis Kriegshauser dropped his election challenge today to last November's slim victory by a Democrat in Johnson County's 16th House District. His withdrawl letter, which was read to the full House, came hours after a legislative committee charged with examining the election found that Democratic Rep. Gene Rardin of Overland Park had won the House seat by two votes. In the letter, Kriegshauser said he had been advised that he could win the seat in a vote by the full House, where Republicans outnumber Democrats 78-47. "However, I believe that such an excercise, regardless of outcome, in today's political climate, would likely impede the thoughtful deliberation of other important matters before this body," he wrote. He also congratulated Rardin on his election. Kriegshauser's withdrawal means the House won't vote on the issue and avoids what could have been a bitter, partisan fight on the House floor next week that could have lingered for the rest of this year's session. The six-member select committee reached the same conclusion as Johnson County District Court Judge Steve Tatum after a hearing last month on a challenge. Rep. Mike O’Neal, GOP chairman of the six-member select committee, said the written report of the panel’s findings will be voted on tomorrow.The report is expected to be approved by all six committee members, three Democrats and three Republicans. Five provisional ballots counted after election day were being challenged by Eric Carter, Kreigshauser’s attorney, because he said four of the five were cast by voters who didn’t live in the district. Carter asked that these votes be taken away from Rardin’s victory margin, which would have made Kreigshauser the winner. The committee didn’t go along because if was unclear who those voters had chosen in the 16th District race. Their ballots had been commingled with hundreds of others. The fifth disputed ballot belonged to a woman who voted in advance, along with her husband but they put their ballots in the wrong envelopes. The husband was able to correct his mistake in time, but the woman was not. The judge counted the ballot anyway, including it Kriegshauser’s total, based on a sworn statement she signed as to which candidate she supported. That unopened ballot was delivered today to the committee by Brian Newby, Johnson County election commissioner, and opened. The woman had voted for Kreigshauser and Rardin’s margin of victory stood at two. We missed it yesterday, but it was Ronald Reagan Day in Kansas. The Kansas Senate took up a resolution naming February 6th Ronald Reagan Day. The 40th President was born on that day, 96 years ago, in Tampico, Illinois. "Ronald Reagan is an icon of optimism, faith and hope in the American people," said the resolution's sponsor, Sen. Tim Huelskamp, a Fowler Republican. He cited Reagan's role in ending the Cold War, the dismantling of communism in the former U.S.S.R., economic growth and the "restoration of pride in America, her values and those cherished by the entire free world." Should discrimination against gays be made illegal? A panel of Kansas lawmakers took up a bill that would outlaw discrimination based on sexual orientation, adding it to a list of protected attributes like race, religion, color, disability, gender and age. The bill, SB 163, would make it illegal to fire someone or deny them a job, housing or a hotel room based on their sexual orientation. A similar bill went nowhere two years ago, the same year the state passed a Constitutional Amendment banning gay marriage. The Senate Federal & State Affairs Committee looked at the bill Tuesday, and heard from gay Kansans who said they had been fired from jobs after their boss found out about their sexuality. One lawmaker testified against the bill. Rep. Janice Pauls, a Hutchinson Democrat, argued the bill would lead to a rush of lawsuits from disgruntled former employees. She also said giving gay Kansans legal protection from discrimination would "fly in the face of a lot of beliefs people have" about the morality of homosexuality. No committee vote has been set. Debate and action on a $44 million tax break for business this year is expected in the Kansas House later this week. The measure, which would eliminate the state's business franchise tax, was approved by the House Taxation Committee Monday. Numerous amendments are expected, including one to phase out the tax over several years and another that reflects a proposal by Gov. Kathleen Sebelius to reduce the number of businesses affected by the tax. Sebelius issued the following statement recently saying that total elimination on top of other tax cut proposals "isn't financially responsible." The Kansas Senate also is likely to turn up its nose at a complete one-year elimination. Taking on the Kansas Supreme Court: "Tilting at windmills"
Another year for the Kansas Legislature, another attempt to change the state Constitution to prevent another school finance fiasco. Sen. Phil Journey pushed his proposed Constitutional Amendment, SCR 1601, which would eliminate the requirement that the Legislature make "Suitable" provision for school finance. In its place would be language stating that the Legislature shall "provide" for school finance in the "manner and amount as determined solely by the legislature." It's not likely to pass, even though lawmakers are still smarting from the bitter school finance battle played out in the courts. A series of similar attempts to limit the jurisdiction of the court in school finance litigation or change the way justices are appointed has failed in the past two years. And even Journey admits his bill probably isn't going anywhere. But he said he just couldn't sit idly by as the Legislature's power of the purse is attacked. "Sometimes you just have to jump on your donkey and tilt at the windmill," he said. A legislative committee agreed today that Democrat Gene Rardin of Overland Park won the contested election to the Kansas House of Representatives in Johnson County’s 16th District. The committee -- evenly split between Republicans and Democrats -- backed a decision last month by Johnson County District Court Judge Steve Tatum that Rardin had beaten his Republican opponent, John Dennis Kriegshauser, by two votes. Eric Carter of Overland Park, Kriegshauser’s attorney, said he will consult with his client later today on whether to withdraw the election challenge. Carter has contended that four challenged ballots accepted by Johnson County election officials were cast illegally by voters who didn’t reside in the House district. However, lawmakers said they were unable to determine who those voters chose in the House race because the ballots were commingled with 1,300 other provisional ballots and could not be identified. Carter had asked the committee to subtract three of those votes from Rardin’s total because he said they were probably cast for the Democrat. Democrats on the committee praised the committee’s Republican chairman, Rep. Mike O’Neal of Hutchinson, for conducting the election inquiry in a nonpartisan manner. Rep. Jim Ward, a Wichita Democrat, said the committee looked at the facts presented by both sides of the challenge and reached its decision based on those facts and not partisan politics. O’Neal said two previous election challenges in the early 1990s were handled in a non-partisan manner and that he was determined to make sure this case was handled the same way. “These election contests are tough,” he added. A meeting to finalize the committee’s recommendation is scheduled for tomorrow. If Kriegshauser withdraws, it would avoid what some believe could be a bitter, partisan fight on the House floor sometime next week. A majority vote by the full House, which is overwhelmingly Republican, could give the election to Kriegshauser.